We have a lot of puzzles and board games and other things that live in cardboard boxes around here. 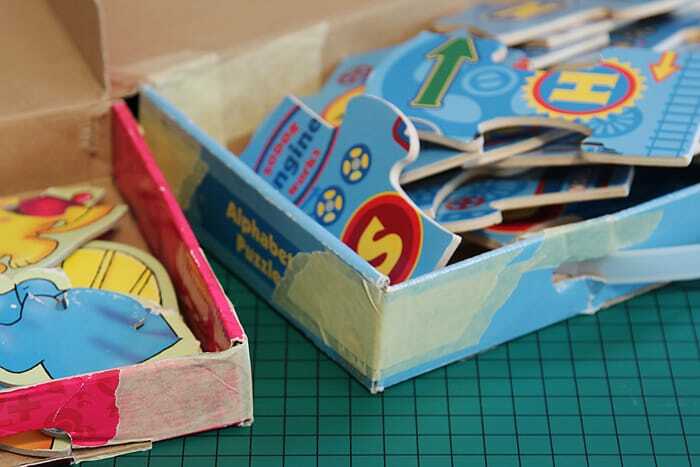 The problem is that after some hard playing the boxes tend to pop their corners and get all ratty. Not to mention it gets hard to find places to store all those bulky containers. I got tired of sticking all the boxes back together. So one day I decided to make some pouches to keep the puzzles in, which greatly reduced the amount of storage space needed on our shelves. I made them from clear vinyl so that the kids could easily see which was which. These are super quick and easy to make – the hardest part is having to use three different feet. All these fabrics were a gift from Krista. Merci cherie! You can estimate how big the pouch needs to be by looking at how much you need to put in it. 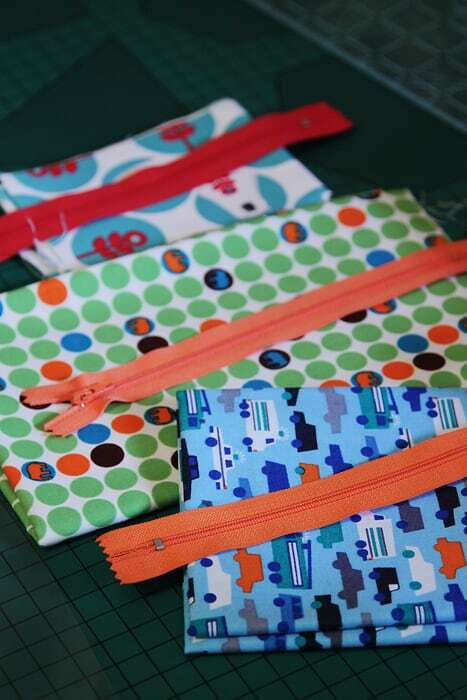 Cut two identical pieces of vinyl for each side of your pouch and then cut two pieces of fabric the same width as your vinyl. How long you make your fabric depends on how much of a fabric accent you’d like. 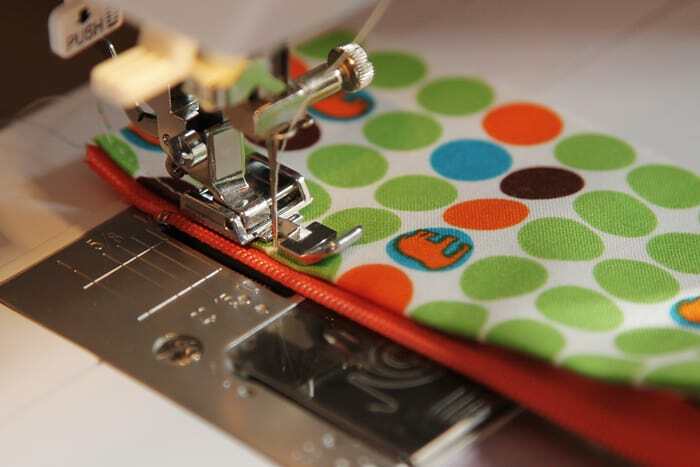 Sew your two fabric pieces to your zipper with a zipper foot. Most importantly: sew a test line with some scrap fabric and vinyl. Then you’ll know if you need to fix your tension at all. Once you’ve done your test line you can sew the real thing. I pressed my seam to the fabric side with a not-too-hot iron, under a cloth (to avoid melting the vinyl). 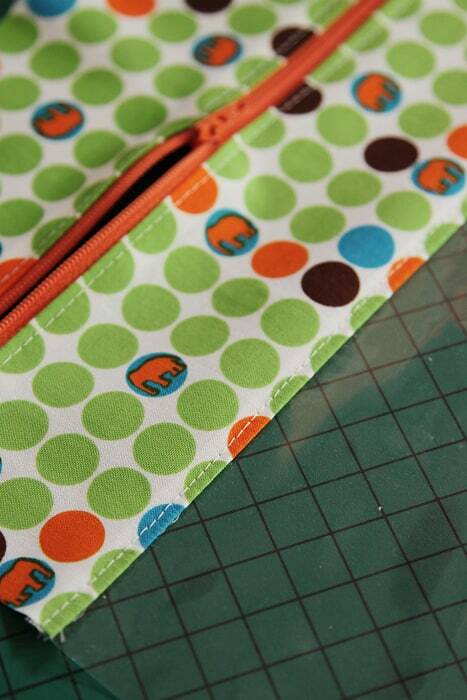 I then topstitched the seam to the fabric so it wouldn’t show through the plastic. Then match your two right sides together and sew around the outside edge of your pouch (choose a pretty, matching thread as you’ll be able to see it). 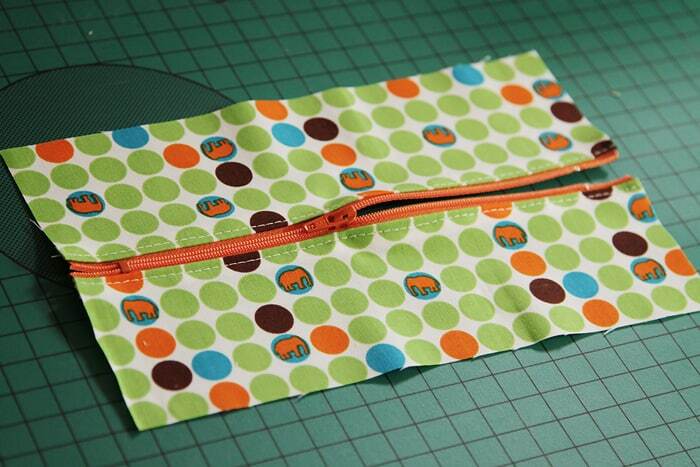 Don’t forget to open your zipper to about half way so you can turn it right-side out again! Sewing plastic layers together without them sliding all over the place requires a few quick changes. Put a patch of masking tape or matte (not shiny/slippery) sticky tape on the bottom of your foot, as below (this helps with grip). Go back to your regular tension. Again, a quick test on scraps is recommended. 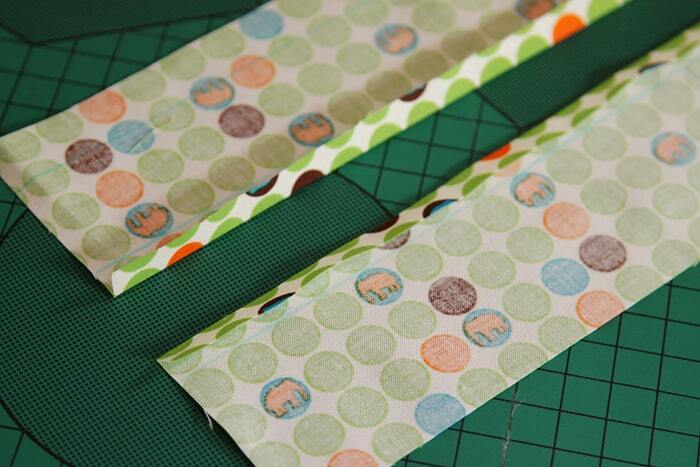 Once you sew the vinyl it is perforated forever, so you can’t really unpick and sew again. Once you’ve sewn all around the edge (I used the above foot setup on the fabric part too, no probs) you can clip your vinyl corners a little. Then turn inside out and you’re done! Fill ‘er up with all those puzzles. Any gift, no matter how small, looks extra classy when in a custom-made pouch. P.S. While you’re here, why not sign up to receive notification of all my free tutorials and new pattern releases? Kirsty, this is just AMAZING. 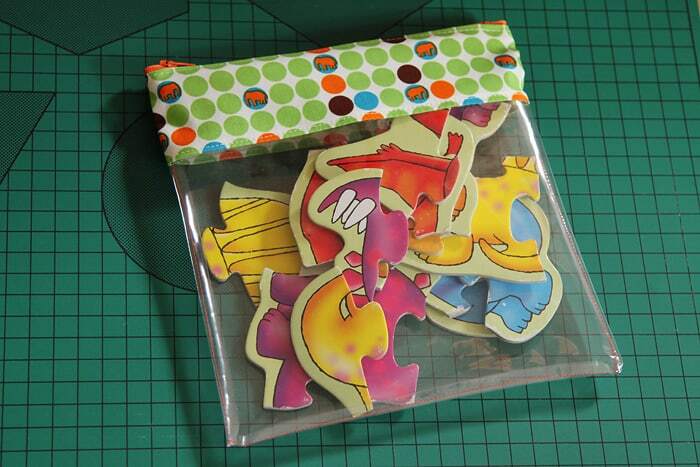 Thanks for the tutorial, great idea these vinyl pouches. Great tute… these look amazing. Back into the swing? Hows the new machine? Love this, great idea ! I love this idea. I have some vinyl and will have to get busy making some pouches. These are fabulous Kirsty! Functional and stylish at the same time! Thanks for sharing your expertise! Great tutorial, will have to make some for my grandchildren. Thank you. You’re such a smarty pants! Great idea! Love this. I have been thinking I needed something like this in our house and now I know how! Very clever idea to add the fabric at the top. Looks great , but when you turn it inside out isn’t there a chance the tread will rip out of the vinyl? If you are really rough while you turn it it’s probably possible to rip the vinyl. I just took my time and it came out fine. ¡Que buen tutorial! Y el resultado de esta buena idea es perfecto…¡felicidades! Fabulous idea Kirsty. Very chic! That’s awesome Kirsty!! Love the pretty pieces of fabric at the tops. The idea of toilet bags is brilliant. Kirsty, where were you when my house was littered with toys through all those years of raising my four?! Hi there, I am new on your blog. The vinyl pouches are such a great idea. Must put on my to do list! Thanks for sharing. Cheers! Great sacks. Thanks for the tip on using masking tape. I usually use tissue paper as a buffer when sewing Vinyl and then you just tear it away once you are finished. 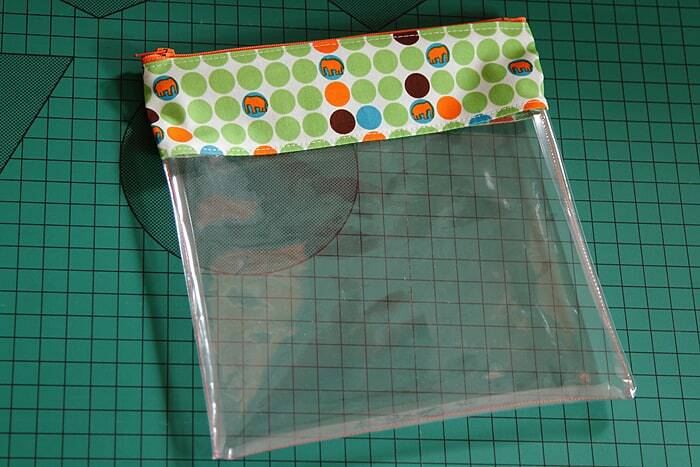 You could use binder clips to keep the vinyl in place when sewing two pieces together. I plan on making a few of these! FUN! Thanks for the inspiration! Very simple and very cute! It’s a great idea! placez vous perpendiculairement a la surface a percer. This is a great tutorial I have seen many and yours is the best. Thank you I have been looking for pouches like these, to organize my things in my huge handbag. What a great idea, Diane! Thanks for dropping by. Loved the tute. I made several as per your directions, but did not care for the floppy top. I then made the vinyl taller and covered it with the fabric. It worked out nicely and now has more structure. Thank you for the info. 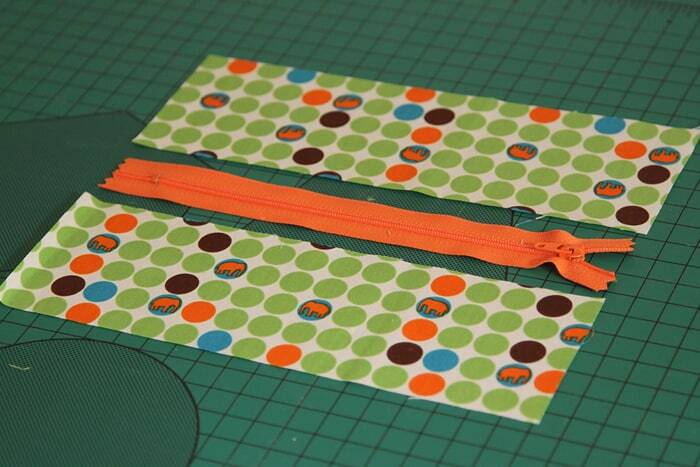 You can add light weight fusible interfacing to the fabric too, which will give the fabric more body, less droopy..